They were supposed to be the second-string from owner Lee Shin Keun and trainer Seo Beom Seok. Instead, Sun Hero ran out the length and a half winner of the Breeders’ Cup at a frozen Seoul Race Park this afternoon to become the peninsula’s champion Juvenile of 2010. In second place was stablemate – and pre-race favourite – Sun Blaze. Shrewd punters would have noticed that jockey Moon Se Young received a five-day riding ban last weekend but had asked for it to be deferred by one week to allow him to ride today. In doing so, he ruled himself out of a chance to ride in the Grand Prix Stakes, the nation’s most prestigious race in a fortnight’s time. Clearly he believed Sun Hero wasn’t there just to make up the numbers. 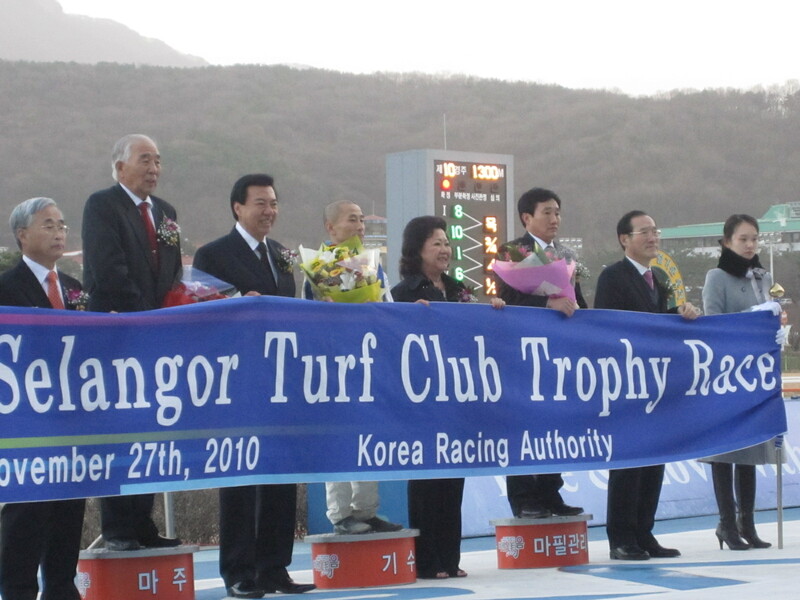 And Moon, whose ban means he will almost certainly fall short in his quest for the jockey’s championship, was at his imperious best as he kept Sun Hero just off the lead early in the 1300 metre race, bringing him to the front inside the final furlong and holding on as Sun Blaze and Park Tae Jong came challenging down the centre of the track. As they returned to scale Moon celebrated with the exuberance of a man for whom a plan – and a gamble – had paid off. The Breeders’ Cup race was an amalgamation of Busan’s Breeders’ Cup and Seoul’s Herald Business which in previous years had been the two tracks’ Juvenile championships. Significantly, today’s race was restricted to colts and fillies who will be eligible for next year’s Triple Crown races and was the first time that colts and fillies from Seoul and Busan could face off against one another prior to the three-year old Classics. 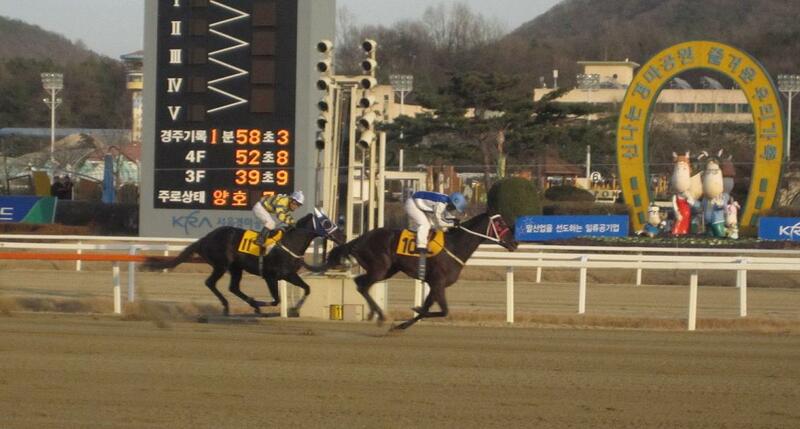 Seoul today took first and second place but in third was Busan’s 150/1 outsider Useung Touch. Sun Hero and Sun Blaze not only have the same trainer and owner but also the same sire, Menifee. Indeed Useung Touch meant a clean sweep for the stallion who arrived in Korea in 2006 and whose first crop of two-year olds look destined for great things. 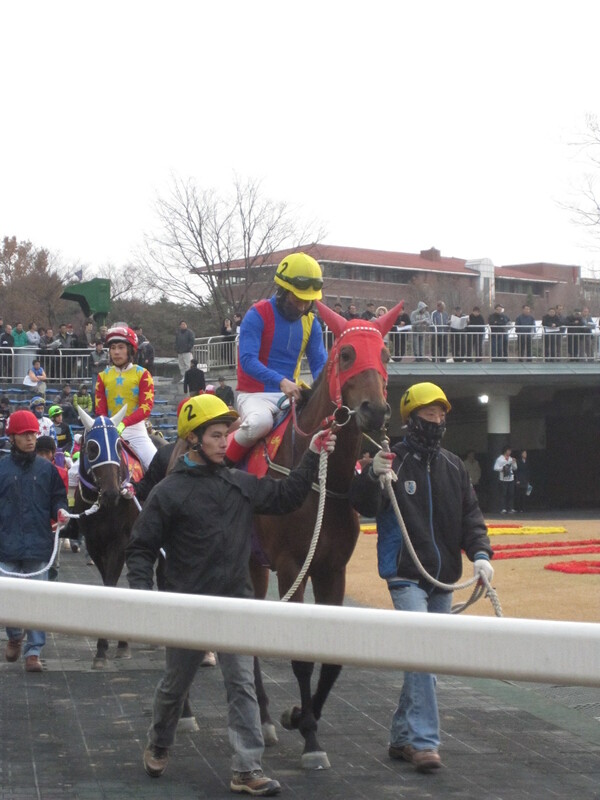 Disappointments of the race were Busan’s highly rated pair of Heukdujanggun and the previously undefeated Hwallyeok Energy. They finished eleventh and last respectively. Recently Busan has dominated the Classics, today will give Seoul heart but a lot could happen between now and next April when the best of the generation will convene in Busan for the KRA Cup Mile. One race later on a bitterly cold day, five-year old Kahnui Jeonseol, produced a surprise win in the afternoon’s feature handicap. The New Zealand bred gelding edged out K J Khan and Owners’ Cup winner Serendipper by half a length. For Kahnui Jeonseol (Howbaddouwantit), it was his first win for nearly two years, his first at class 1 and only his third overall. Meanwhile, joining him at Class 1 in future will be Balhaemyeongjang. The three-year old edged out Cheongha Eutteum for a narrow win in race 8. 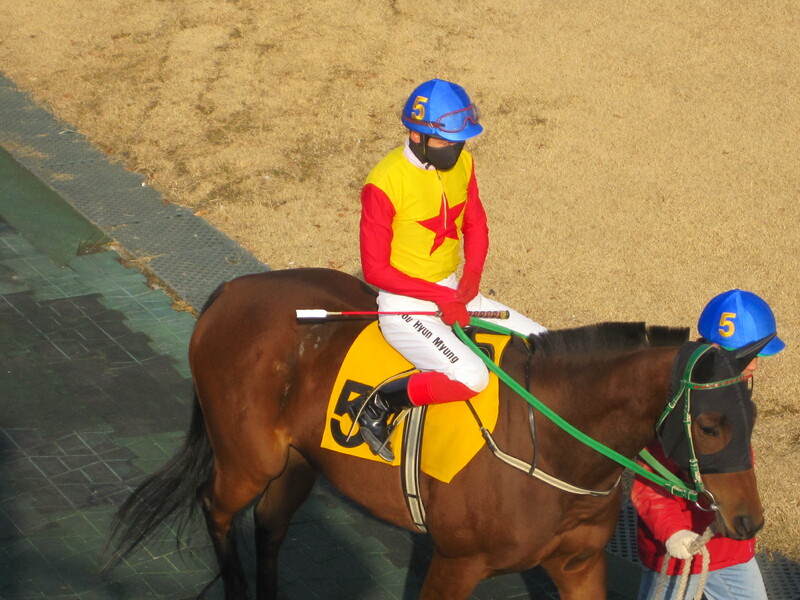 While five jockeys from Busan were in town for the weekend, only one of them, You Hyun Myung, rode a winner. You partnered filly Gyemyeongui Bit to an easy victory in race 7. Back home on the South Coast, those jockeys missed out on a six-race card, the star of which was fast improving colt Wanggol. The three-year old Australian import took on a host of the track’s elder statesmen in the feature race. He had few problems dealing with them though as he made all to romp to a two-length win from Full Forest and Admiral Reigart. Wanggol (Jet Spur) now has a record of five wins from eight starts. And so ends another fabulous weekend’s entertainment at the racecourse. Next week it’s the Busan Owners’ Cup and the week after it’s the biggest of them all, the Grand Prix Stakes at Seoul. We start our build-up to both of them tomorrow. It was close, but up against some of the brightest young imported fillies, Korean bred Urikkot did just enough to clinch victory in the Selangor Turf Club Trophy at a bitterly cold Seoul Race Park this afternoon. Sent off the slight favourite, Cho Kyoung Ho and the lightly raced three-year old hit the front in the home straight after early leaders Blown Sky High and Kkochyeol faded and though tiring herself, built up enough of a lead to hold off the challenge of Blueband Mama and Boo Min Ho who swept by just the wrong side of the line. A late starter, Urikkot (Creek Cat) only debuted as a three-year old this year. She’s now won four of her six starts. This was the sixth running of the Selangor Turf Club Trophy and STC Chairman Datuk Cham was on hand to present the awards. Unfortunately, hardly anyone was around to hear his speech as the 40,000 punters in attendance had retreated to the warmth of the grandstand to escape the biting wind, long before the presentation got underway. Also in attendance were two Malaysian jockeys, Veerapan Sivan and Salleh Mutaza. Neither troubled the placings in the STC Trophy, however, Mutaza scored a third placed finish in race 5 on Daedamham. For jockey Cho Kyoung Ho, it was a second trip to the Presentation stage in as many weeks, following Dongbang Rose’s Nonghyup win last Sunday. The day got even better for Cho as immediately after the STC, he guided Lucky Mountain to victory in the afternoon’s feature handicap. 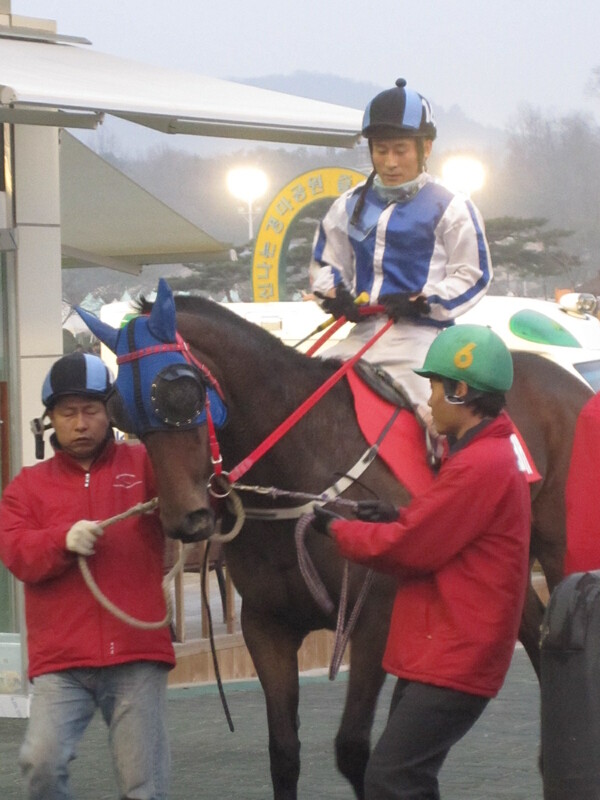 The five-year old mare scored a half-length win over Winner Prince and favourite Janggun Bada. With main rival Moon Se Young riding his last weekend of the year before a five-meeting ban kicks in, Cho is also in pole position to claim the jockeys’ championship. 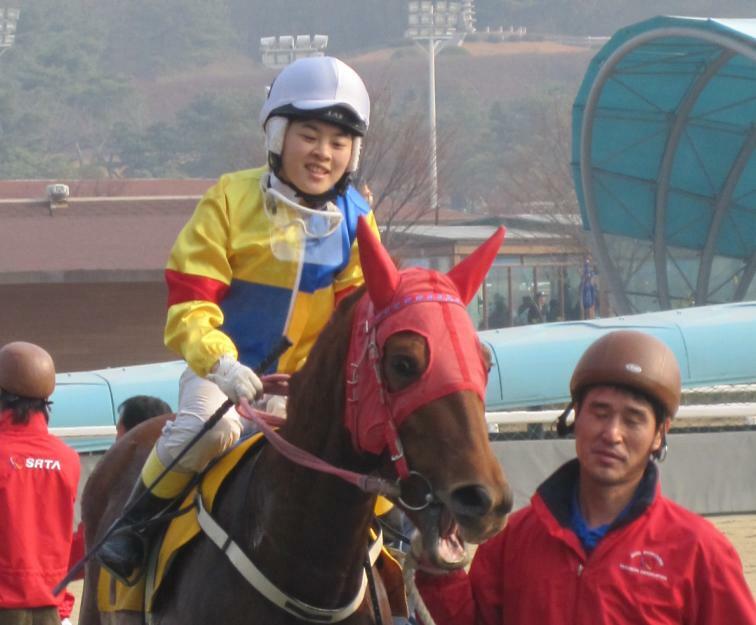 Speaking of jockeys, it was a good day for the small contingent of female riders in Korean racing. Lee Keum Joo rarely rides these days but she made an appearance in race 1 at Seoul today and it was a winning one as she partnered Cheonguntaehu to a half-length win over favourite Yahoo Event. It was just a seventeenth win for Lee in a nine-year career. Already closing in on that figure is Kim Hae Sun. The twenty-two year old claimed her eleventh win as she got the best of a four-way photo finish to race 6 on filly Miss Nine. Down on Jeju Island, Kim Da Young was newly licensed this year and she already looks set to follow Na Yu Na and Kim Ju Hee who are both established as top riders in the pony racing colony on the island. 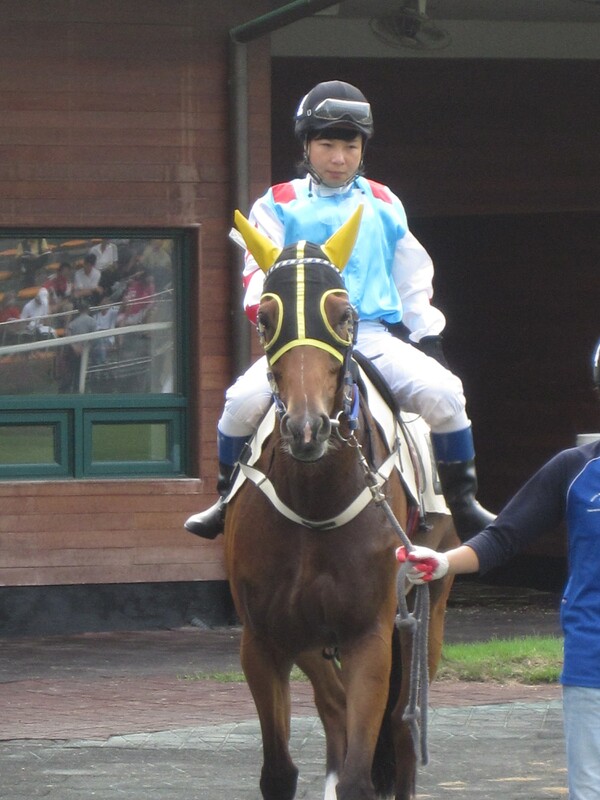 Today she scored her fourth winner, guiding Uryangsidae – a pony she’s won on before – to victory in race 2. Racing returns to Seoul tomorrow when Sun Blaze and Heukdujanggun will be favourites in the Breeders’ Cup at Seoul Race Park. There are eleven races at Seoul from 11:20 to 18:10 and six at Busan from 12:40 to 16:30. 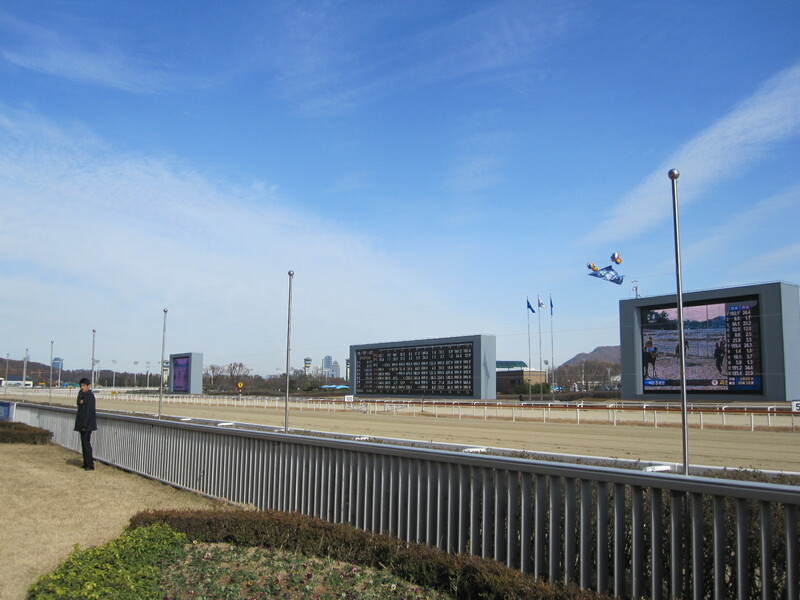 In English, his name means “Beautiful Racing” and even though it’s thoroughly coincidental, the Busan Racecourse has a publicity song which has his name in the chorus. Not that anyone involved with that most likely has a clue who he is but today, Areumdaun Jilju returned after an eleven-month lay-off to win the feature race at Busan. Sent off second favourite in a mile-long race which was led for its early stages by a loose horse after Black Scorpion had thrown his jockey when leaving the starting gate, Areumdaun Jilju stalked leader Mupae Star before reeling him in and overtaking him in the final furlong while favourite Deep Desire closed strongly to grab second. 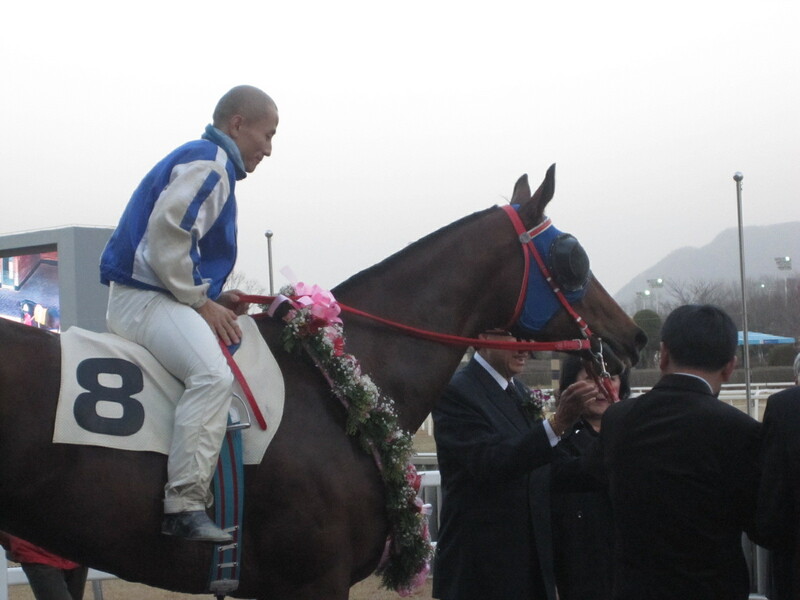 For Areumdaun Jilju [Didyme – Chills Of Nepal (Nepal)] it was a fifteenth win from twenty-five starts. Now six, he has never finished outside of the money and his return means a welcome addition to the contenders for big honours among Korean-bred horses at Busan. While most of the country shivered today, down at Busan it was reasonably pleasant as Japanese jockey Toshio Uchida, who had been very quiet since returning to Korea two weeks ago, got back among the winners. “Mr Pink” grabbed race 5 on Good Dream and then the class 1 race 6 with a narrow win on Night Moves (Proud Accolade). The filly, who was champion juvenile with her Breeders’ Cup win last year, got up to beat Tamna Hero and Mulbora by a neck in a blanket finish. Meanwhile, Yoshi Aoki ensured there was a third Japanese victory today as he partnered Real Winner to victory in race 9. The most visually impressive performance of the day came in the 1300-metre all-foreign bred race 3. Two-year old American born gelding Viva Ace (Macho Uno) was sent off long odds-on favourite and didn’t disappoint as he led wire-to-wire to record a twelve length victory. It was his second win from three starts. Saurday’s thoroughbred action is at Seoul Race Park where there are twelve races from 11:20 to 17:50 including the Selangor Turf Club Trophy. There is also pony racing on Jeju Island with ten races from 12:10 to 17:30. * The KRA produces English language Stewards’ Reports for all meetings at Busan – today’s can be downloaded by clicking here. One of the best developments in Korean racing over the past few years came two years ago when Korea’s very biggest races were made open to horses from both of the peninsula’s thoroughbred tracks. 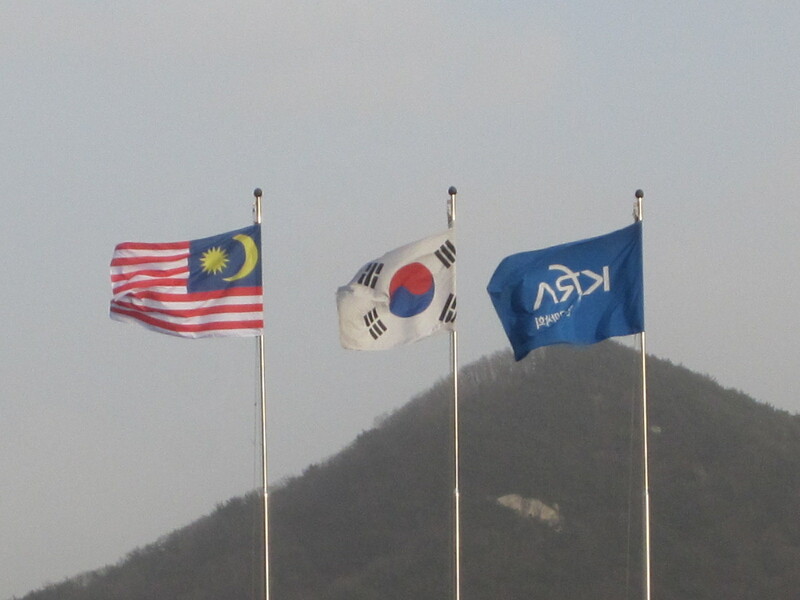 Although Busan Race Park opened in 2005, it wasn’t until 2008 – when the first foals to be attached exclusively to the new track came of age – that horses from Busan could compete in the Korean Triple Crown races. Last year another two races – including the Grand Prix Stakes were opened up to the Southerners. More progress has been made this year. Seoul’s top two stars Tough Win and Dongbanui Gangja met for the first time in Busan while earlier this month, Busan horses – and jockeys – returned to the capital to sweep the placings in the President’s Cup. This weekend for the first time, the nation’s two-year olds get in on the inter-city action in Sunday’s Breeders’ Cup at Seoul Race Park. Open only to two-year old colts and fillies who were both bred and born in Korea, it means all the entrants will be eligible to take part in next year’s Korean Triple Crown series. Five youngsters from Busan have made the trip North, chief among them the unbeaten filly Hwallyeok Energy. For Seoul, Gaemamusa and Sun Hero are among the leading contenders. However, there is a lot of potential all the way through the full field of fourteen that will go to post under the floodlights on Sunday afternoon. See below for a full list of runners, records and riders. It’s set to be a chilly weekend in the capital with the threat of sleet or even snow on Saturday. While the newcomers in the Breeders’ Cup are the highlight, there are a number of more recognisable names racing for big prizes over the weekend. Indeed at Busan on Friday Areumdaun Jilju, previously Busan’s top home-grown horse, returns after nearly a year on the sidelines. Now six-years old, he has a record of 14 wins from 23 starts and has never been out of the money. How fit he is will be tested to the maximum though against a small field containing regular winners Wonder Unicorn, Yoreumbi and Deep Desire. If that wasn’t enough, on Saturday at Seoul it’s the Selangor Turf Club Trophy which has some emerging imported talent in it. Skiff’s Chic (With Distinction) and Blueband Mama (Purge) join unbeaten Grand Ace (Grand Slam) in the event which features two Malaysion jockeys. They are Salleh Mutaza and Veerapen Sivan. Unusually for Korea – and in a most welcome development – both visiting jockeys have been given additional rides thorughout the day. Second in the Sports Seoul Cup and third in the Korean Oaks, today Dongbang Rose finally landed a big Stakes prize as she snatched victory with a late run in the Nonghyup Chairman’s Cup at Seoul Race Park this afternoon. 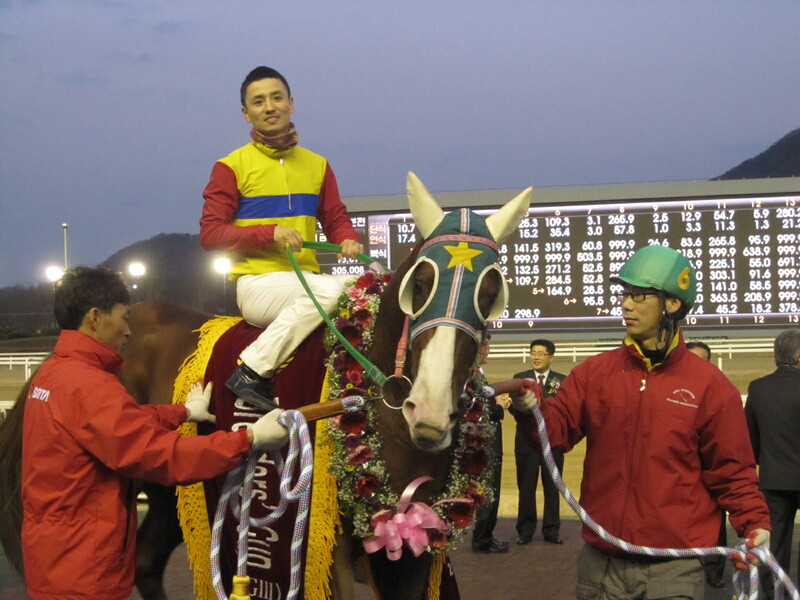 Dongbang Rose now has six wins from ten starts. With Euro Fighter’s unlikely Oaks win looking more and more a flash in the pan and Sports Seoul winner Cheonun currently out of action, she can conceivably claim to be the nation’s top three-year old filly. For jockey Cho Kyoung Ho, it was a fourth stakes win of the year and his second consecutive win in this race, after his victory on Lucky Mountain last year. While Cho scored three wins today, there was a milestone of sorts for apprentice jockey Kim Hae Sun. Kim scored the tenth winner of her career with an emphatic victory on two-year old filly Cara Line in race 4. In that race, three of the five licensed female jockeys at Seoul had rides. Like the others, Kim has never really been given the rides that alllow her to show her talent. When she gets them though, she doesn’t let anybody down. Down at Busan there were no feature races but there was another win for the burgeoning partnership of Australian trainer Peter Wolsley and Japanese jockey Yoshi Aoki. The pair combined to win race 1 with the debut-making filly Brave Cougar to continue their recent hot run of form together. Aoki, who is quickly establishing himself as one of the top riders at Busan also recorded two further second-place finishes while fellow Japanese rider Hitomi Miyashita was also amongst the winners with highly rated US-bred filly Queen Of Rain (Lion Heart) scoring in race 3. Winter seems to have given us a bit of a reprieve for the time being so where better to spend the weekend than the racecourse? There are cards at Busan and Jeju on Friday, Seoul and Jeju on Saturday, and Seoul and Busan on Sunday. Sunday is the highlight at Seoul when a full field of thirteen fillies will race for the Nonghyup Chairman’s Stakes. Korean Oaks winner Euro Fighter heads the field, but after a disappointing run in the Gyeonggi Governor’s Cup three weeks ago, she’ll have her work cut-out to prove that her Classic win wasn’t a fluke – Dongbang Rose was third in the Oaks and could go two better on Sunday. See below for a full list of runners, records and riders. On Saturday at Seoul, there is a return for Symphony Sonata after a six-month lay-off. 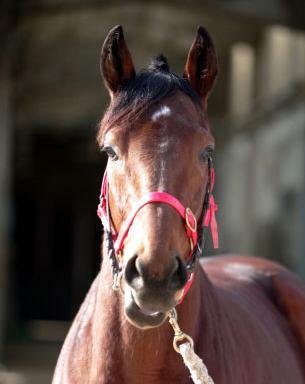 The lightly raced five-year old is the only foal out of First Violin to have been born during her short time in Korea. Symphony Sonata has a record of six wins from fourteen starts over his two year career. He’s going in a competitive class 1 handicap. Free Woody, Brothers and Machine Gun carry top weights but it looks a very open field. Three Korean jockeys and two trainers have been banned from the sport for illegally passing on information to betting rings. All of the five, who were based at Seoul Race Park, had their licenses revoked last week after the conclusion of an investigation by the KRA’s Finance Committee. Among them, the most well-known is veteran jockey Kim Ok Sung. Nicknamed the “Smile Jockey” because of his ever-present Cheshire-cat grin, Kim scored 443 winners from 5826 rides during his career which spanned 23 years from 1987. His biggest win was in the 1996 Grand Prix Stakes on Hula Mingo (Broadway Aly). He also won the JRA Trophy and the Donga-Ilbo and Segye Ilbo Cups. Only this year, he recorded a Group victory on Serendipper in the Owner’s Cup. Also involved was Lee Sung Hwan, who turned professional in 2001. He won 74 races from 1434 mounts. Meanwhile, Lee Jung Sun, who originally had his license revoked in April had the decision confirmed. 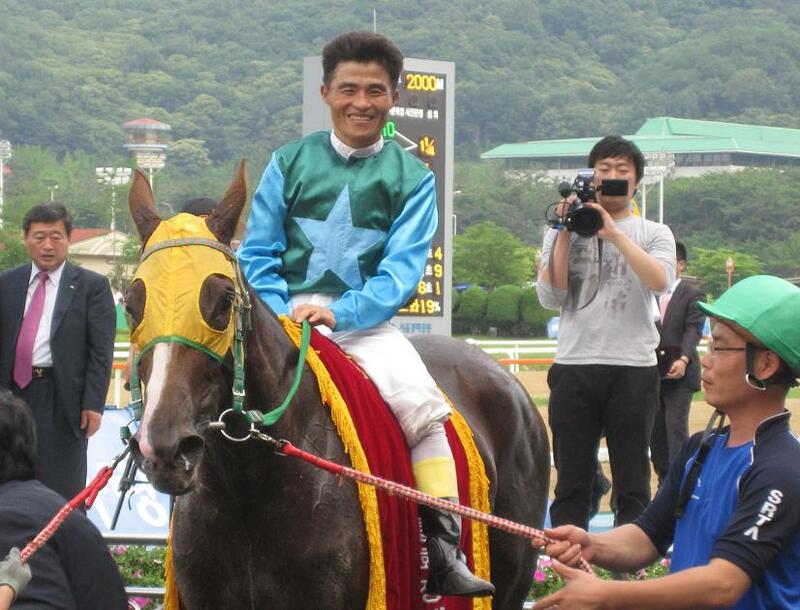 Kim Hye Sung recently took up a trainer’s license after retiring as a jockey. In the saddle, he qualified on the same day as Kim Ok Sung and scored 477 winners from 4708 rides. He won the Korean Oaks on Espass (Psychobabble) in 2001 and partnered the great Kwaedo Nanma (Didyme) to five Stakes victories between 2001 and 2003. The other trainer was veteran handler Kang Seung Yeoul. Kang saddled 5500 runners returning 512 winners. His biggest win was with Tourney’s Mountain (Lost Mountain) in the 2005 Ilgan Sports. Corruption in racing is taken extremely seriously in Korea where, with a ferocious regulator and negative public sentiment towards gambling, it is vital that the industry is seen to be clean and fair. Equal access to information for all punters is important. While many form-guides are available for purchase by racegoers, they contain no information that isn’t freely available to everyone on the KRA’s Studbook site including detailed past-performances and workout records. Jockeys, trainers, grooms and KRA staff are subject to very strict rules and even minor infractions are punished severely – especially if it relates to contact with illegal gaming houses. 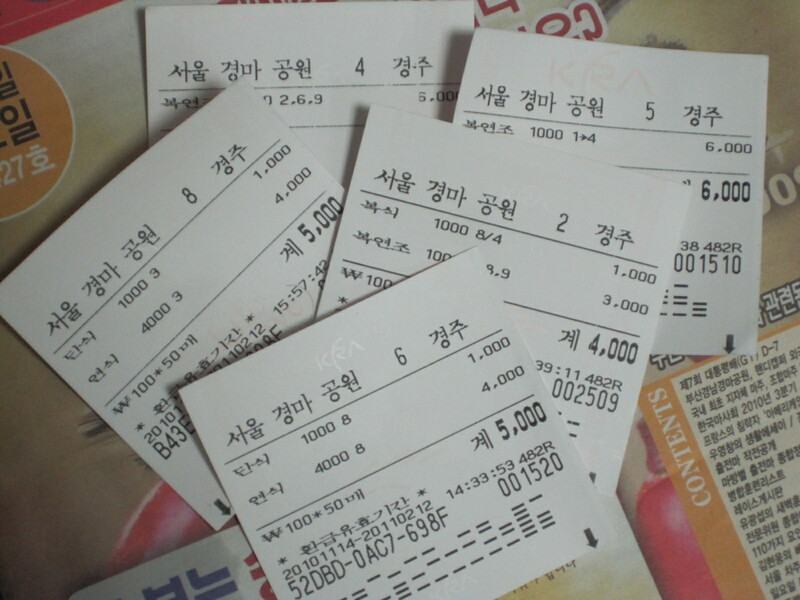 These criminally run organisations offer higher stakes and lower take-outs than legal betting with the KRA and are thought to be on the rise, especially in rural areas, since – to protect the public from gambling – the National Gaming Control Commission managed to close down the KRA’s internet and telephone betting services last year.